Turn MHT to PDF page layout files online and without ads! Use a MHT to PDF Online Converter or get a batch App for more! Get MORE ACCURATE results with the desktop Total HTML Converter. 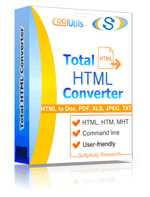 Total HTML Converter supports HTML, MHT, HTM, XHTML files. When a new HTML standard is released we will add it too! With Total HTML Converter you can enable or disable Java scripts on your pages. This handy option will save you hours of time! Total HTML Converter converts all CSS styles and you always get neat results. Total HTML Converter can stop slow scripts. If there is a loop on your page, it still can be converted in reasonable time. Switch to OpenOffice in seconds by converting HTML to ODT. Combine several HTML files into one multi-page TIFF or PDF file with our HTML Converter. Total HTML Converter features fit-to-page option. It is extremely convenient: you convert hundreds of different HTML files and get the perfectly laid out documents. When you convert HTML to JPEG you can customize the final image to your needs. Set the desired quality of the JPEG image to compromise the file size. Convert HTML or MHT files via our clear wizard-mode interface. The widest list of output file types: DOC, PDF, HTML, XHTML, TXT, XLS, RTF, TIFF, JPEG, PNG, ODT, EMF, SVG! Total HTML Converter supports DPI and paper size for TIFF. Select the quality and size of the output TIFF images. Total HTML Converter has a built-in Preview panel so that you could find the file you need faster. Add text or image watermarks (your logo or any other image) to the header or the footer of the output file. It works for stamping bates too. Add page counters or a date to every page of the output files in batch. Tell Total HTML Converter if you want to print background or not. When you convert HTML to PDF you can set user permissions, password-protect your files or sign them with your digital signature. Get PDF, PDF/A and non-searchable PDFs. We also offer HTML Converter SDK for Web\SQL server\ASP\.NET\C#. With ActiveX you can easily implement our HTML converter into your application. Total HTML Converter can be run via command line (get the ready-to-use command line from GUI). Description MHT (MHTML) is intended for archiving web pages and combining the HTML code and resources - images, animation, audio files, into a single HTML file. These resources are usually represented as external links. The content of resulting files is encoded in the same way as in HTML email messages. MHT files use MIME type encoding. MHT files are directly supported by Internet Explorer and can be opened in it. Also, they can be opened in Firefox and other browsers, providing users install add-on software. Description PDF file format, developed by Adobe Systems, represents in electronic mode all the elements of a printed document such as text, photos, links, scales, graphs and interactive elements. You can view this document in free Acrobat Reader, navigate through the page or the whole document which is one or more pages usually. PDF format is used to save predesigned magazines, brochures and flyers. Whenever you need to view it, print or send the layout will be unchangeable.